So you think nothing can create the hype of a new car launch like a 60”, million Rand television commercial? Well, think again. Yes, dusty desert sunrise shots and mountain pass panoramas leave one thrilled and excited about the car but there is another way to drive test drives. Radio. When Vizeum approached Primedia Broadcasting on behalf of BMW SA, with the challenge of using radio to launch the new BMW 1 Series the Broadcaster, in partnership with BMW’s agencies, created a radio-centric converged campaign that could deliver on client’s objectives – to drive awareness,engagement and test drives. 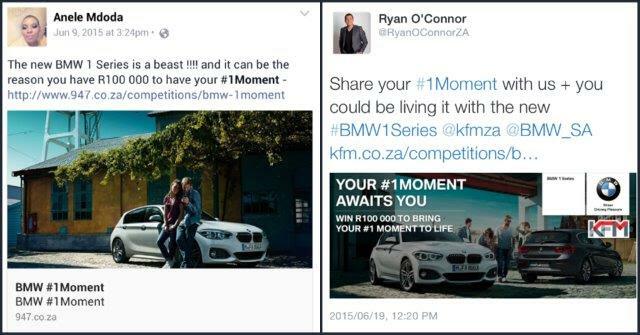 With the central creative idea being “Enjoy your #1Moment” via listeners submitting their unique moments that they would want to experience, BMW together with 947 and KFM created an interactive campaign that lived across both radio stations and their digital platforms. Listeners were asked to submit their experience of a lifetime via Twitter using the hashtag #1Moment. Each station set out to change someone’s life by helping them to experience their #1Moment to the value of R100 000. 947 and KFM put the power of the presenters behind the campaign by using Anele Mdoda and Alex Caige on 947 and Ryan O’Connor on KFM to endorse the concept. Each station got to play with a branded #1Moment BMW 1 Series, for the presenters to experience the vehicle for themselves. Videos were created to highlight their favourite features of the new BMW 1 Series, encouraging audiences to enter the station competition and the idea of test driving the vehicle. A converged campaign that broke through the clutter and effectively communicated the new features of the BMW 1 Series. Listener engagement across all platforms was high with a good number of video views and a large number of Twitter entries. The submissions made for great on-air content and of course #1Moment came true for two lucky listeners, with the winner’s announcements made live in a vibey in-studio activation with the top 9 finalists for each station. “The BMW bespoke campaign worked extremely well for us as it could be crafted to maximize the resources and assets at the station, to drive specific outcomes for the client. The campaign also included tangible engagement with the vehicles, through digital and physical presence in the streets to stimulate interest and drive test drives and sales” said 947 station manager, Ravi Naidoo.